A PERSONAL DOCUMENTARY ABOUT A MOTHER’S JOURNEY THROUGH THE EYES OF HER SON. 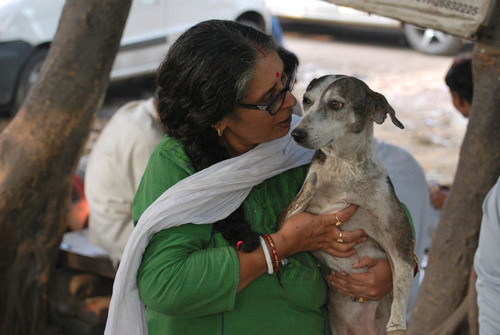 EVERYDAY FOR THE PAST 7 YEARS, SULAKSHMI DASGUPTA (63) COMPULSIVELY COOKS FROM 6AM TO 10AM AND GOES OUT TO FEED 500+ STRAY DOGS TILL SUNSET IN ALL THE MAJOR LOCALITIES OF DELHI. They say ‘Charity begins at home’. Sulakshmi Dasgupta took those very words and made them the mantra of her beautifully obsessive, self-indulgent compulsion. In the process, she has segregated herself from all her family members including her own son (Vikram Dasgupta, 39). Her daily routine (7 days a week, 365 days a year without weekends or holidays), starts when she lights her first cigarette alongside the gas burners in her kitchen, cooking over 250 Kilos of rice, boiled vegetables and meat. After 4 -5 hours of meal preparation, she along with her volunteers drive all across the major localities of Delhi personally feeding over 500 strays with individual care. 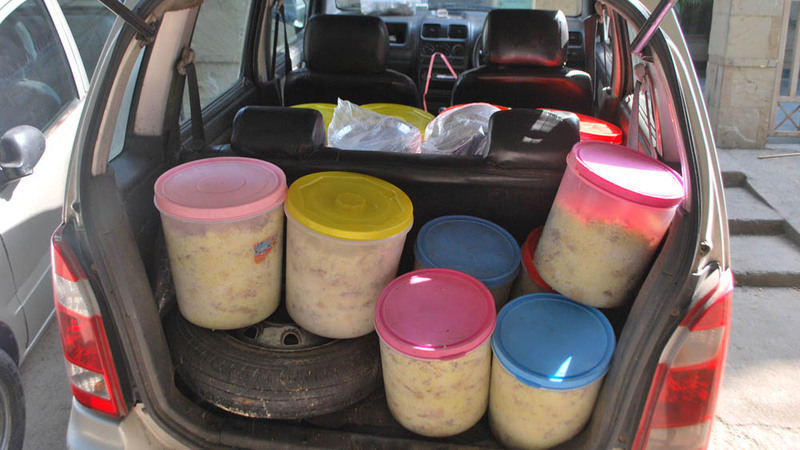 The strays are all served on disposable eco-friendly plates and bowls, cleanly discarded post meals. Sulakshmi has given names to every single one of her bacchaas (hindi for ‘children’) and is completely in tune with what is happening in their lives. 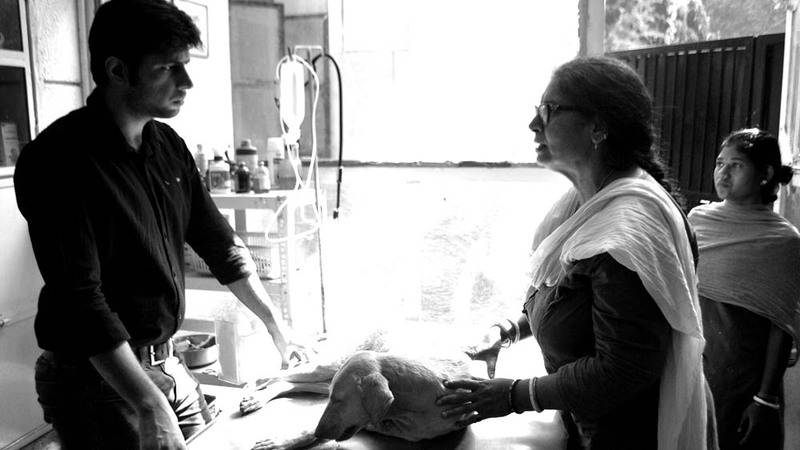 She tries to find the newborn homes and begs, borrows and pleads with the vets all around the city to do X-rays, operations and post operative care for more than 50 accident victims every month. On an average, about 20 strays require other medical attention every month and about 7 dogs are being sterilized per week along with Anti-Rabies and Anti-Distemper injections for every single one of them. Sulakshmi first started cooking meals for stray dogs 7 years back and has been doing it everyday since then, feeding over 500 strays in and around the city of Delhi. Some say Sulakshmi is breathtakingly compassionate while others find her to be downright obsessive to her goal. Fortunately for her, she has had the support of her retired husband (Pinaki Dasgupta, 66) over the years as she has gone through 80% of his life’s savings in her quest to satisfy her dog feeding frenzy. In spite of her own deteriorating health issues (she has had two knee replacement surgeries) she refuses to give up on her daily routine. On being confronted on the subject, her reasons for her selfless actions invariably end up blaming her son’s failed marriage and the consequential inability to yet provide her with any grandchildren. She has distanced herself from her other family members as well including her siblings, uncles and aunts amongst other relatives and has found her schedule unpermittingly hard to visit her son in Toronto. Currently she is at the verge of bankruptcy and is down to her last resort. She is selling off her family heirlooms and ancestral gold jewelry left by her parents, in order to feed her charming self-fulfillment. Vikram believes a ‘film can be an agent of change’. He is compelled to make this film both as a filmmaker and a son. As a FILMMAKER, his intentions are to showcase Sulakshmi in a light he has perhaps failed to see her in. As a SON, it is an attempt to understand the distance his mother has traveled to find her life’s purpose and the loved ones she isolated on her journey. In a Country like India, where rabies deaths amount to more than 20,000 every year contributing to one-third of the world’s total rabies related deaths, feeding street dogs is not always seen in a positive light. Despite the high number of non-profit organizations and animal welfare societies that provide food and sterilizations in collaboration with specialized vet centres, only 15% of India’s stray dogs have been vaccinated. The recent growth of stray dogs in India, specifically in the Southern states of Kerala and Tamil Nadu, has inspired extreme measures from the Government (culling orders and mass killing) and has lead to rise of organizations whose goal is to eradicate stray dogs by killing them. Which in turn has consequently led to the creation of Worldwide Protest Movements to defend animal rights. It has been Sulakshmi’s goal to vaccinate and provide anti rabies injections to every stray so these organizations have no reasons resort to mass killings of dogs. Sulakshmi was born and brought up in joint family of a traditional Brahmin household. She was the eldest rebel daughter of a Guru Shivananda who was in charge of running his own traditional Kali Temple/Ashram. When Sulakshmi was 20, she eloped and married Pinaki, a Creative Director (A term that was fairly uncommon in the 70s) of an ad agency from a different caste against her parent’s will. She has lived life on her own terms with the support of her husband ever since and today she considers herself being a non-traditional chain smoker Brahmin and Mother of over 500 Dogs + 1 Human being. She is a living, breathing contradiction that epitomizes what Karma really means. Not the westernized version we hear nowadays of ‘Doing good karma and good happening in return’, but rather, the definition heard in yesteryears grandparent’s stories. The word ‘Karma’ originated from - ‘Karm’ is Sanskrit for ‘Work’ and ‘Karm-A’ in its entirety means ‘To do’. It suggests that we are nothing more than the ‘work we do’. It is our purpose for existence, not for a reward or a return or an expectation but rather, a definition of our very selves. It’s our work that defines us. 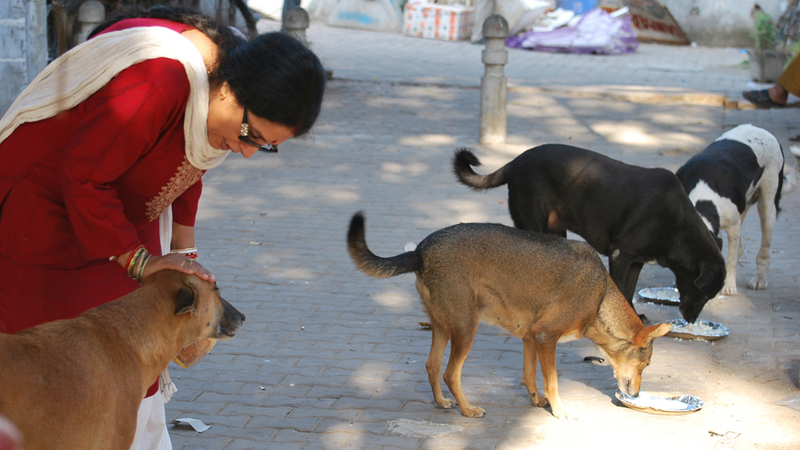 To Sulakshmi, cooking and feeding her dogs is what defines the very existence of her life. This is her ‘Karma’. Sulakshmi started her charity under the name of ‘SwargaSaathi’. The name itself has a contextual reference to the Hindu epic Mahabharata, Swarga (heaven) + Saathi (companion) - ‘Your companion to Heaven’. This particular story takes place when Yudhishtira, the wisest and the eldest brother of the Pandavas was scaling the Himalayas on his walk to the heavens accompanied by his four brothers, his wife and a dog. As the journey kept getting fiercer with each passing day, all his family members started dying one after the other. Yudhishtira in his wisdom realized the reason of their death is due to the sins they may have committed during their lives. On the final stretch to the gates of the heaven, the supreme God Indra appears and offers Yudhishtira to climb into his chariot to enter heaven with him, but without the dog. Yudhishtira refuses because he claims he cannot betray and abandon his friend. He explains that it would be a great sin to give up on this dog that has not given up on him in his life’s journey even while all his other family members had fallen. Upon seeing Yudhishthira's commitment, the dog shows his true form and reappears as deity Dharma. Dharma then praises Yudhishtira for his virtues and Yudhishtira enters heaven on Indra's chariot.